A few months back, my husband and I attended a dinner gathering being put together by his work at a nearby restaurant. Even though I’ve lived in this area of Los Angeles for quite a number of years now, and I’ve dined at nearby restaurants, I’d never actually been to, or even heard of, this particular restaurant where this dinner gathering was taking place. So, I was a bit excited to get the opportunity to try something new. Apparently, my husband’s boss is great, longtime friends, with the owner of the restaurant, and this restaurant as well as other establishments he’s owned, have been in operation for a number of years, so that could only mean good things lay ahead for us! 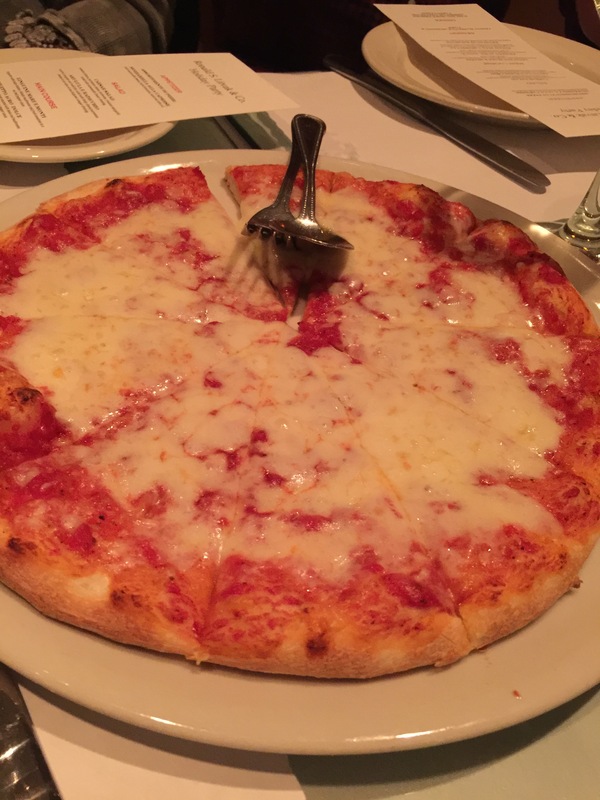 Having opened its doors more than 20 years ago in a small mini-mall in Santa Monica, Il Forno Trattoria, is a local lunch and dinner favorite, especially with nearby business executives who occupy the business park across the street and in the neighborhood. Serving authentic Northern Italian cuisine, the restaurant is a classy, but not stuffy, restaurant surrounding an open kitchen with both indoor and outdoor, seating. Il Forno is kind of a hidden gem amongst a sea of nearby chain restaurants. As we were there as part of a large group dinner, we had a preset menu created just for us. To start, a round of appetizers were brought out to the table for everyone to share. We had an assortment of different kinds of pizzas that were brought out fresh out-of-the-oven. 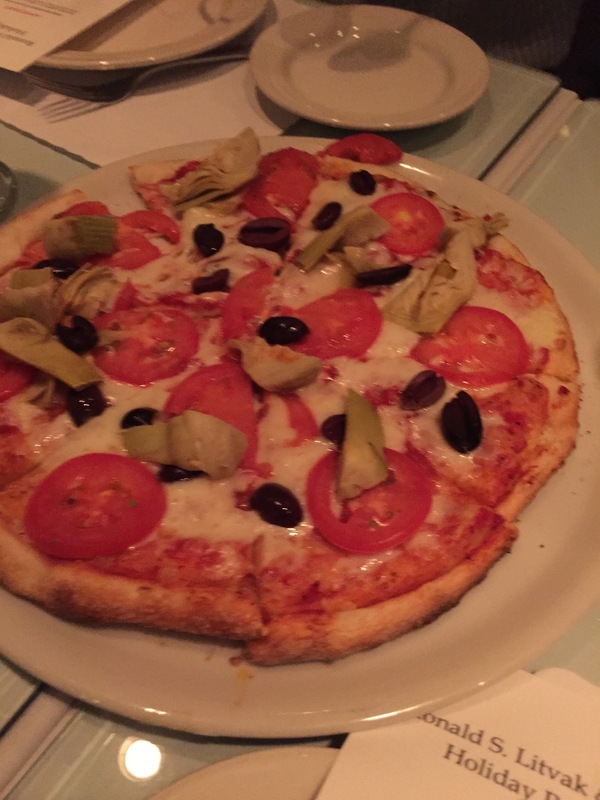 There was the cheese pizza and the tomato, black olives and artichoke hearts vegetarian pizza. The pizza was bubbly and cheesy, and delicious with a good amount of sauce and a good amount of cheese. A terrific appetizer to kind of whet your appetite. Following the pizza, we were presented with the house specialty bruschetta. 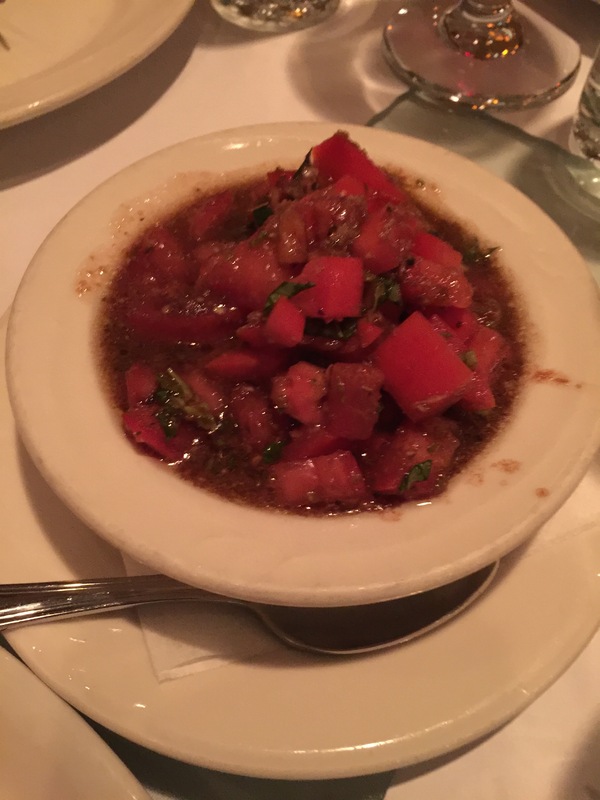 If you think all bruschettas are created equally, you’ve never tried the bruschetta at Il Forno Trattoria. Made with tomato, basil, garlic and balsamic vinaigrette, Il Forno’s homemade bruschetta will blow you away with its bold and rich flavors that seem so perfectly married. 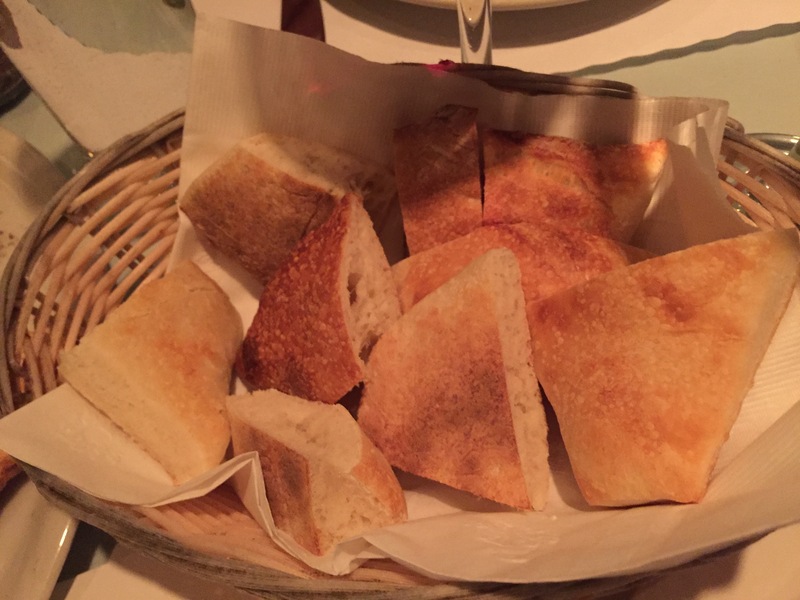 Their homemade bread, which is slightly crusty on the outside, but yet warm, and doughy on the inside is the perfect vessel for the yummy bruschetta. The bread on its own is terrific, but when it soaks up the flavors from the juices of the bruschetta, the whole dish is transformed into something quite magical. 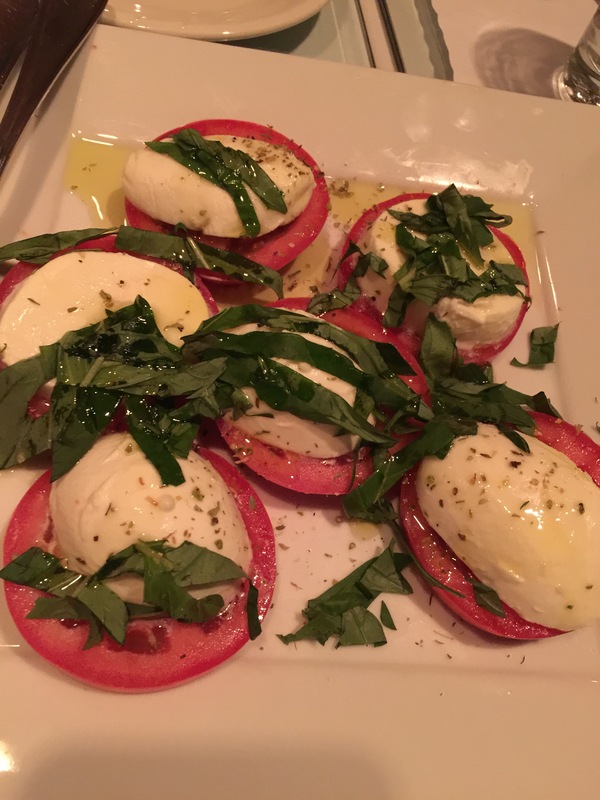 We also were presented with a classic Italian dish of mozzarella alla caprese as our final shared appetizer. Gorgeous fresh mozzarella cheese served over sliced vine-ripened tomatoes, drizzled with olive oil and fresh ground black pepper and basil. Again, simple ingredients served together to create bold flavor with sweet, tangy tomatoes, deliciously creamy and rich mozzarella cheese and the fresh flavor of the sweet Italian basil is just a perfect combination. This dish was a hit with everyone in the group. For the first course of the evening, we each had a choice of 2 different salads. 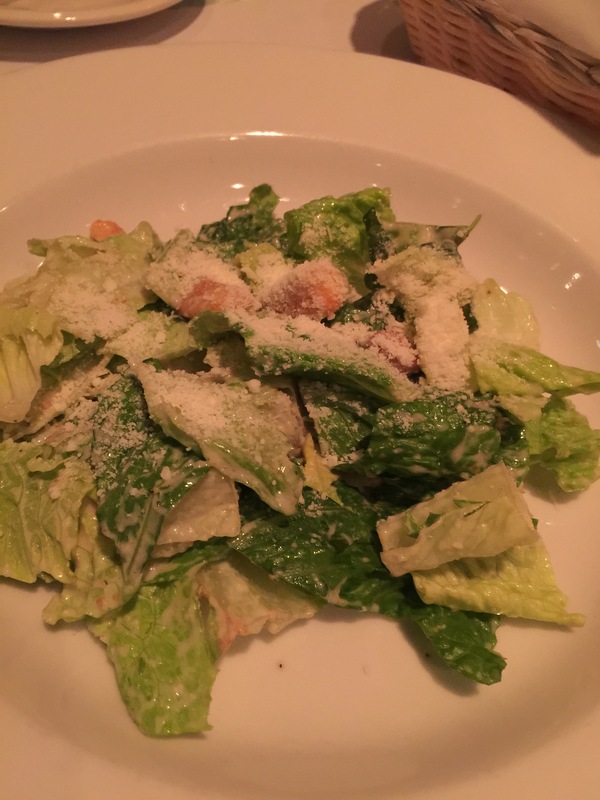 I chose my favorite Caesar salad, made from romaine lettuce, parmesan cheese, anchovies, croutons and garlic tossed with Il Forno Trattoria’s homemade Caesar dressing. As much as people say they don’t like anchovies, it’s really the saltiness and briny flavor of the anchovies that make the Caesar dressing so special. Crispy, crunchy lettuce and thick Caesar dressing is my favorite. My husband chose the other salad option, arugula e radicchio. Made with organic arugula and radicchio salad with thinly shaved parmesan cheese in a simple olive oil and balsamic vinegar dressing. Here we have simple ingredients again, with a simple classic dressing which shows off the peppery flavor of the arugula and the bitter bite of the radicchio. 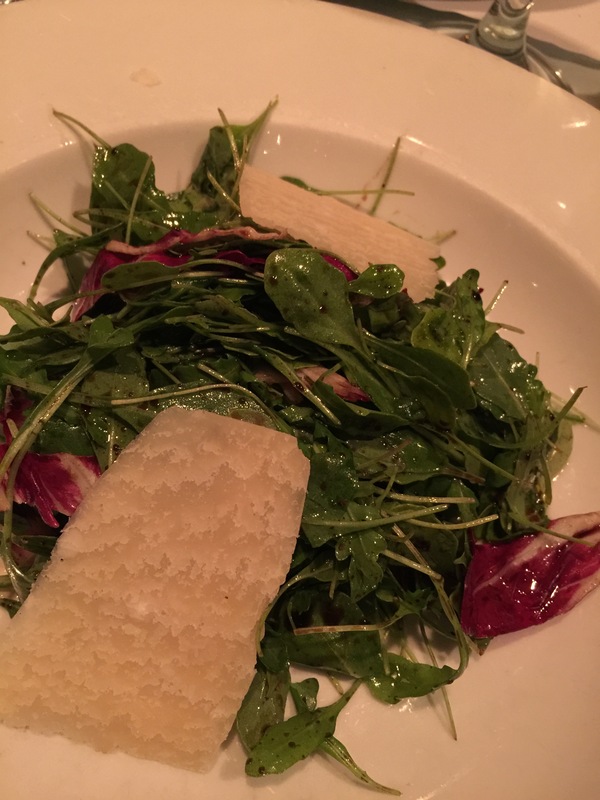 The parmesan cheese adds the bit of saltiness that you need to add to the flavor of the salad. With the main course, we also were given two different options to choose from. Like our first course of salad, my husband and I decided to each choose a different main dish so that we could try both dishes. However, honestly, even if that wasn’t what we were trying to do, we would have chosen different dishes just based upon the different types of foods we each prefer. My husband ordered the linguine mare e monti. 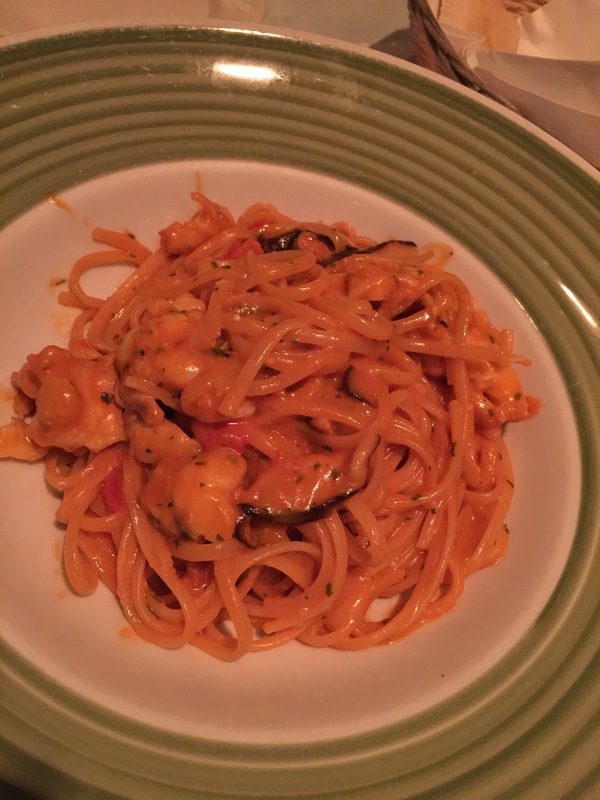 That’s linguine with baby lobster, shiitake mushrooms and fresh tomatoes all tossed in a red bell pepper sauce. The pasta dish had a great deal of lobster meat in it, which was nice to see that the restaurant didn’t skimp. and it was well cooked and tender. The red bell pepper sauce actually had a little bit of a bite to it, which added a great amount of flavor to the dish overall. This linguine dish turned out to be quite rich and the bite of bell pepper was actually a bit more than expected. My husband loved the dish, and I’m glad that I didn’t order it because it would have been too spicy for me. Instead, I ordered the filetto arco dolce, which was grass fed, range filet mignon sautéed with leeks and mushrooms in a port wine and balsamic vinegar sauce. 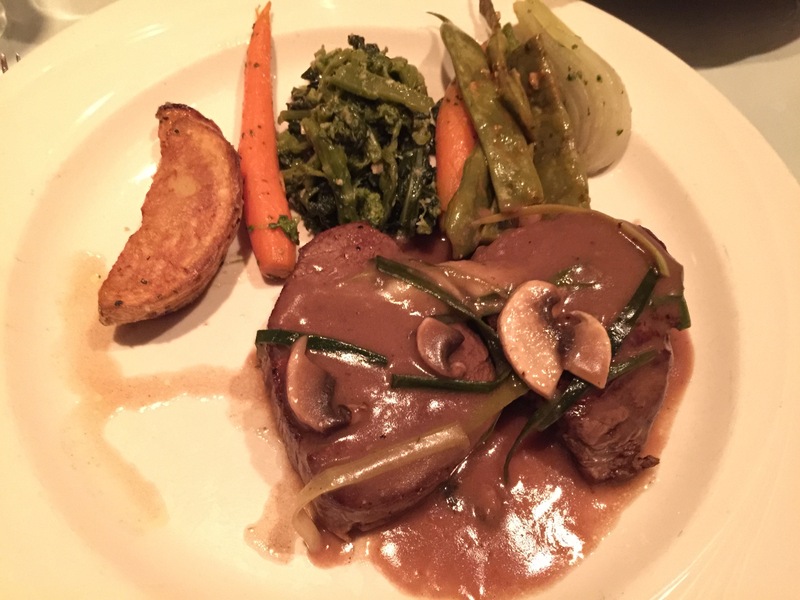 Served with sautéed vegetables, the filet mignon was perfect cooked and quite tender. The port wine and balsamic sauce was a great compliment to the filet as it was nice and tangy, and slightly sweet. As I’m not a fan of mushrooms, I didn’t bother with the sautéed mushrooms, but the sautéed vegetables that came with the dish was well cooked and good pairing with the rich and heavy meat. This dish, while seemingly not too big, actually ended up being quite filling and I wasn’t quite sure I could finish it. But, it was so good that I decided I just needed to eat every last bite rather than trying to take what little was left home. By this point in time, I think we were all full. After the multiple appetizer dishes we all shared, plus the salad and the entree, we were all pretty stuffed. But what’s a celebratory meal without dessert? Our dessert for the evening was a lemon hazelnut meringue cake. Pre-sliced for us in the kitchen, we were each presented with a piece of cake. At first blush, the cake looked rather plain and unassuming. That is, until you took a bite of cake. This cake was just awesome. The lemon flavor was strong enough to create a tart bite to the cake, but subtle enough that you weren’t overpowered by lemon-citrus bite. The fact that this was a meringue cake made it awesome in the fact that the cake, while still soft and fluffy had a great crunch to it from the meringue, which was the key ingredient to this cake, in my opinion. 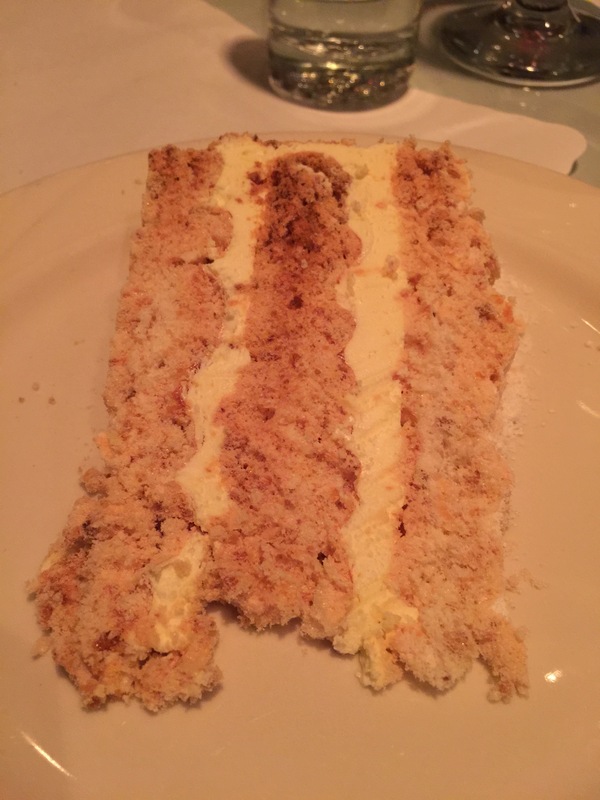 I loved the textural feel of the crunchy meringue, the softness of the cake, the lemon flavored cream filling and the subtle flavor of the nutty hazelnut. Such a terrific cake, which I liked so much that I ended up finishing off my husband’s piece of cake as well. My husband and I were so pleasantly surprised by Il Forno Trattoria. We live in an area that’s filled with chain restaurants, or high-end frou-frou restaurants where it’s more important to be seen than what’s actually on the dinner plate. However, Il Forno Trattoria breaks this mold. 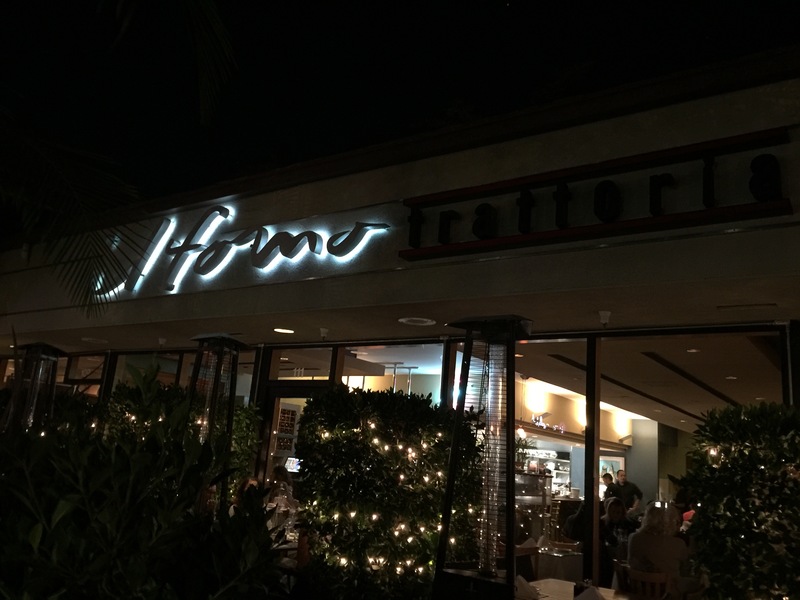 This local gem of a restaurant in an interesting and unique location in Santa Monica delivers on terrific and authentic Italian food in a quiet, comfortable setting that is just so inviting. It’s basically the antithesis of all the other local restaurants that it only adds to the appeal of this restaurant. I wouldn’t hesitate to recommend Il Forno Trattoria for anyone looking for something good and different in the local area.